What Is Applique With Fusible Web? Appliques are simple fabric cut-outs that are applied to a base fabric. It can be a very simple way to embellish clothing or any fabric item. Fusible web is very popular for applique but some people prefer to have turned edge appliques that are hand sewn in place. Fusible web (sold as Stitch Witchery, Heat N Bond, and other trade names) melts to adhere the fabrics together. ​Fusible web can be available in various weights. Although it might seem like a heavy bond will adhere better, it is not advisable if you will be sewing the edges. Heavy bond also will be stiff after it is melted. Heavyweight fusible web also is apt to ooze through lightweight fabric so it should be avoided unless a very heavy bond between the fabrics is required. Lightweight bond is preferable when doing applique so that the fabric still moves and the sewing needle easily can penetrate the fabric. There are no-sew fusible options to join fabric as well. Finishes applied to the fabric in the manufacturing process can prevent fusible web from adhering to the fabric. To be sure that the fusible web will adhere to the fabrics, wash the fabric before starting the fusing process. Always read instructions that come with the fusible web. Press the fabric so that it is flat and smooth prior to applying fusible web to the fabric. Once the process to adhere the fabrics is achieved, the raw edges of the applique should be protected or enclosed if the item is going to be laundered to prevent frayed edges on the applique. Fabric paint or machine stitching is the most commonly used method to protect the edges of the applique. Now let's get started. Start with a simple design such as those found in early-education coloring books. Many basic clip-art images can be transformed into an applique design. In this example, we're using a tulip from a coloring book. Trace the edges of the design onto the paper side of the fusible web. Cut a piece of fabric slightly larger than the desired applique and fuse the melting side of the fusible web to the wrong side of the fabric that you will be appliqueing. Use a scrap of fabric that is larger than the piece of fusible web to eliminate the risk of fusing the web to your ironing surface. Placing parchment paper under and over the applique will prevent the fusible web from sticking to your ironing tools. The fusible web will not stick or adhere to the parchment paper. Many people also save the paper backing from the fusible web to use while ironing fusible web. With the fusible web adhered to the applique fabric, cut along the lines you traced to trim the design. Peel the paper off the fabric. If you are preparing a lot of appliques at one time, peel the paper off as you are ready to use them since the fabric may tend to curl and the curling could make placement difficult. Lay out the design on the base fabric and gently press it into place. Turn the fabric over and press from the wrong side, using a pressing cloth if necessary to protect your fabric from direct contact with the iron. 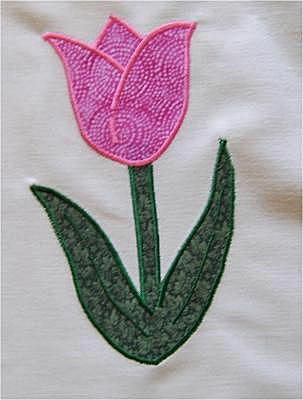 Using a satin stitch or fabric paint, enclose the edges of the fabric applique and add the drawing details. Use stitching to "draw" any lines or details you want to add to the fabric. Experiment with using different color thread and ​embroidery thread, different stitch widths, different stitches, and straight stitching just as you would use a different color or thickness when drawing or outlining if you were drawing the picture.